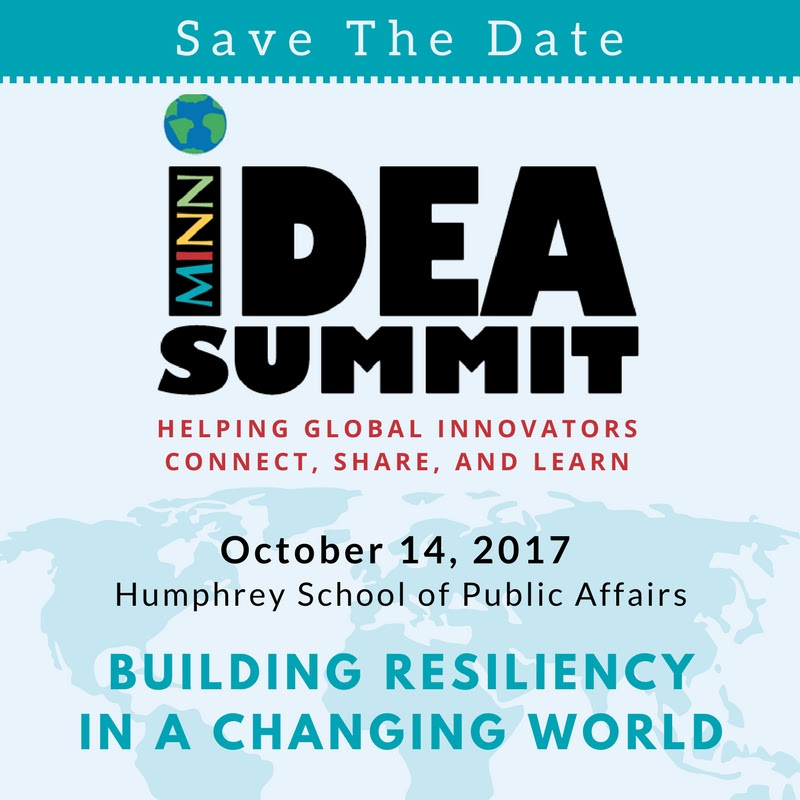 The MINN IDEA Summit has been set for Saturday, October 14th at the Humphrey School of Public Affairs. Save the date for the 5th annual IDEA Summit, which will focus on building resiliency in a changing world. The IDEA Summit offers global innovators a unique opportunity to connect, share, and learn. Since 2013, the Summit has brought together more than 850 participants, 100 speakers, and 350 unique organizations. With discussions and activities on topics like creative evaluation methods, starting a social entrepreneurship endeavor, and conflict resolution among diverse stakeholders -- the Summit is a fun and engaging experience that helps convene a remarkable community of people connected to international development work. To help prepare for this year’s upcoming Summit, we're currently accepting applications for breakout session speakers, fellows, marketplace tables, and volunteers. Stay tuned for additional updates in the coming weeks. If you have questions about the MINN IDEA Summit, please email us at ideasummit@minnesotangos.org. MINN is looking for innovative, engaging, and experienced speakers to host 60-75 minute breakout sessions based on global development work. Click here to Submit your Session Proposal Application. Please note that applications are due by July 14, 2017. If you have questions or would like recommendations for topics, please contact the IDEA Summit Speakers Committee at ideasummit@minnesotangos.org. You can also visit the summit website to see examples of past breakout sessions.